It's about time I made a post on all of my favorite places to dig into some amazing vegan food around Chicago. I know from personal experience how hard it is to find vegan food around the city. For starters, many places don't advertise themselves as "vegan," yet they still have vegan options. Along with that, many places have vegetarian meals that can easily be made vegan. On top of that, there are several restaurants around the city that are known for their vegan dishes. Instead of scavenging the internet to find which restaurants are vegan-friendly, I decided to create this one-stop-shop on the best vegan food you can find in Chicago. Bon Apitit! This burger joint is surprisingly vegan-friendly. Bareburger offers a variety of different vegan burgers, apps, and even shakes. Unlike McDonalds or any other famous fast food restaurant, Bareburger has more unique options like their Farmstead burger (a combination of sweet potato, kale, and wild rice), Guadalupe burger (a patty comprised of black beans, roasted corn, and poblano peppers), and their Thai Chia patty (quinoa, chia seeds, and green peas). All of these burgers are made 100% vegan, but if you're into cheese, Bareburger also offers a tangy slice of vegan-approved American cheese. And, if you have a sweet tooth, Bareburger also has shakes that are made without any animal products: think a toasted coconut shake, chocolate peanut butter shake, and a minty cookie shake. The Chicago Diner is the O.G. of vegan restaurants here in the city. Even the diner's slogan, "Meat Free Since '83" proves it! While their entire (Yes, entire) menu is completely plant-based and free of any living creature, you wouldn't know it from tasting it! Each item--from their mac and cheese, to their reuben--tastes like any animal-product dish that you can get from most American restaurants. If the humongous menu intimidates you, two words: SEITAN. WINGS...even my chicken wing-loving boyfriend thinks they're amazing! This Japanese restaurant is where I discovered my love for Tom Yum soup. Circle Sushi has debatably the yummiest version of this dish that I have ever tasted. For those of you who aren't familiar with Tom Yum soup, it's a refreshingly spicy broth made from lemongrass and lime juice, and filled with fresh vegetables and sometimes tofu. This dish hits the spot on cool rainy days, or honestly any time when you're craving something warm and nutritious. While you can order Tom Yum soup at most Japanese and Thai restaurants, Circle Sushi hands down has my favorite. While Uncle Julio's is somewhat of a chain restaurant, they are one of the only mexican dining spots that offers a variety of vegan eats. Some of the dishes are obviously vegan and others are not so much. The obviously vegan dish at Uncle Julio's is their grilled vegetable fajitas. I have always been a fan of fajitas, so it saddens me when places don't offer a vegan option. Here, Uncle Julio's serves up a huge platter filled with deliciously grilled veggies with beans and rice. Since I'm not a big tortilla person, I have asked for lettuce on the side and have made myself lettuce wraps out of the fajita ingredients--it's so yummy! Another, less obvious dish on the menu is the Acapulco Seafood Salad. Obviously, vegans don't eat seafood, so I substitute the fish for grilled vegetables and beans. This salad is a bit pricey, so before getting the check I always make sure to talk to my waiter to see if they can do anything about the price, but vegetables are significantly cheaper than fish--I have never any of my waiters at Uncle Julio's tell me no! The final, and most delicious part of Uncle Julio's is their Tableside Guacamole. 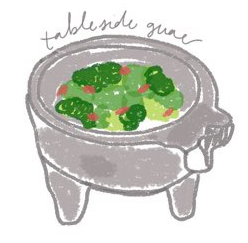 If you haven't eaten at Uncle Julio's before, you can get their tableside guac for free just by signing up for their email program at their website. Once ordered, a chef comes to your table with a cart full of avocados and all of the guac fix-ins--think onions, jalapenos, tomatoes, and more! The chef prepares the guac per your ingredient request, and mashes the avocados right in front of you. The result? Extremely fresh guacamole that is delicious to put on fajitas, a salad, or dip chips into. R E A L G O O D J U I C E C O . A juice bar? That's vegan? Groundbreaking. Real Good Juice is one of my top favorite places to get juices, smoothies, and (most importantly) vegan ice cream. Up until this past January, I had never tried any of their food items. But, after trying, it's safe to say that their vegan eats are just as good as their juices. The real star of Real Good Juice is their NoYo: NO YOgurt. Their froyo is made out of the same ingredients that their juices are made from: dates, vanilla, almonds, filtered water--that's it. If you're an LA or NYC native, then you've probably had Pressed Juicery's vegan ice cream. For those of us who reside in the Midwest, Real Good Juice's NoYo is super similar. Not only is the ice cream itself delicious, but you can get toppings like vegan cookie crumbles, vegan and paleo granola, fresh fruit, and almond butter on top. Pro tip: Always call before going to get NoYo, because more than 50 percent of the time their machine is broken (sad, but true). As for their food, I have only tried their chia pudding, brussel sprout and cranberry farro bowl, and the sweet potato toast. All three of these dishes were amazing (even my parents think so! ), and I assume that the rest of their food is just as tasty! As a little FYI, all of their locations carry juice, smoothies, and food, but only their Old Town storefront has the NoYo. Believe it or not, I really dislike veggie burgers. Most of the time they're mushy and lack flavor. But, when I discovered Old Town Pour House's veggie burger, I immediately fell in love. Unlike other vegan burgers, Pour House's is made with delicious spices and is encrusted in tortilla chip strips. I love ordering their burger without a bun and a side salad on the side because I cut up the burger and put it on top of the salad to create a hearty and satisfying salad. While they don't have many vegan dressing options, their balsamic is super tasty and their side salad always has a lot of fresh vegetables in them. And unlike other burger joints that fry their fries in animal fat, Pour House's french fries are 100 percent vegan. So if you're ever in the mood to treat yourself to some good ole bar food, make Old Town Pour House your next go-to. If you follow any health "influencer" on Instagram, then chances are you have heard of True Food Kitchen. This restaurant is known for its healthy anti-inflammatory dishes that cater to people of all diets: carnivores, vegetarians, vegans, and even paleos. True Food is one of my favorite places to dine at for fancier occasions, as their prices are a bit more steep (but totally worth it). I can't go to True Food without ordering one of their refreshing drinks. My favorites to sip on is their Hangover Rx concoction of fresh squeezed pineapple and orange juice with coconut water and honey, and their Kale Aid which is a combination of kale, ginger, apple, and celery juices. Instead of high-sugar drinks such as soda like other restaurants offer, True Food has drinks filled with nutrient dense ingredients that will help heal your body, rather than harm it. Along with drinks, I also occasionally get an appetizer when I dine at True Food. Some of the tastiest apps are their Roasted Heirloom Carrots and their Charred Cauliflower. Since both of these dishes come greek yogurt or tahini on the side for dipping, I always ask for them to substitute their vegan almond ricotta for dipping--it's incredible. 1) Seasonal Ingredient Salad: This bad boy is to die for. It's made from the freshest ingredients that are in season, and finished off with a savory horseradish dressing. If you're unsure of what to order, this dish is always a winner. 2) Butternut Squash Pizza: This 'za is the best I have ever eaten in my life. It's 100% vegan and the sweetness of the cranberries and squash combined with the savoriness of the almond ricotta is a powerful combination. Not-to-mention their crust is the perfect meld of doughy and crispy. The only sad part about this pizza is that it's only offered in the fall and winter, so get it while you can! 3) Ancient Grain Bowl with Tofu: Imagine stir fry but 100x better and a lot more nutritious! This bowl is a combination of miso-glazed sweet potatoes with mushrooms and other veggies topped with hemp seeds. If you go to True Food super hungry, then I would recommend getting one of their bowls, as they are larger than some of the other options. 4) T.L.T. Sandwich: If you're a new vegan or not a vegan at all, then this sandwich is a tasty cruelty-free option. True Food substitutes the bacon found in a normal B.L.T. for smoky tempeh. I have never been a fan of bacon, but this vegan option is so delicious and satisfies any sandwich craving. I like to think I was one of the first people to discover Sweetgreen here in Chicago, as I went to their original location in Washington DC on a family vacation some odd years ago. When I was walking around River North last year, I was so excited to discover that Sweetgreen as put down some roots here in Chicago, and I knew that it would become one of my favorite places to get food from. For those of you who aren't familiar with Sweetgreen, it's a build-you-own salad restaurant that caters to a variety of diets including vegan, vegetarian, and paleo. While they have a ton of delicious menu options (the Spicy Sabzi is one of my favorites), Sweetgreen also gives you the ability to create your own salad concoction. Sweetgreen is perfect if you're ever craving a boujee salad, but want something more than the basic caesar or chopped (though my boyfriend is obsessed with Sweetgreen's ceasar salad--it's the only one he gets). Unlike California where raw vegan eats can be found in abundance, Chicago is lacking. But when I heard about Chicago Raw from my mom, I knew I had to check it out! Chicago Raw is the city's only raw vegan shop that sells pre-made raw vegan meals, made-to-order smoothies and acai bowls, and other yummy raw vegan desserts. I have yet to try their meals (as they're a bit pricey), but I have tried their smoothies and they are delicious. All of their ingredients are super fresh, and you never have to feel guilty for eating things like deep dish pizza or lasagna ever again! Foodease is honestly a hidden gem and perfect for tourists and natives alike. Similarly to Whole Foods' salad and hot bar, Foodease is a giant salad bar inside of Water Tower Place that has a variety of premade salads, fresh vegetables and fruit, soups, sushi, and hot dishes. If you're ever spending the day walking up and down Michigan Avenue shopping and realize that you're hungry, don't succumb to unhealthy eats like M Burger or McDonalds, nourish your body with fresh made dishes from Foodease. If you're a vegan or a vegetarian who's never heard of Native Foods—what have you been doing?! Native Foods is one of the original chain eateries to have an exclusive plant-based menu. 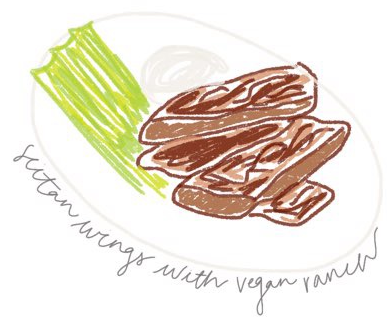 Their items are veganized versions of well-known comfort foods: cashew mac and cheese, seitan chicken wings, homemade chicken and waffles, and others. Native Foods is the perfect place to dine when you're craving something not necessarily healthy, but 100 percent animal cruelty-free. Dining out in Chicago as a vegan is easier than you would expect. From the popularized vegan-friendly restaurants, to the hotspots that are a bit more discreet, there's something for everyone to indulge in! What's your favorite vegan-friendly restaurant in Chicago? Let me know in the comments below! ** Disclaimer: All images in this post are copyrighted by Brunette with a Budget 3/27/2018.